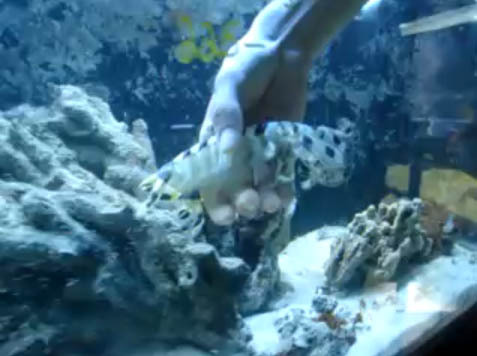 We just saw this video of a hobbyist holding a 12 inch Zebra Mantis Shrimp! First off DO NOT TRY THIS. The Lysiosquillina maculata (common names Zebra Mantis Shrimp, Striped Mantis Shrimp, Bumble Bee Mantis Shrmip) capture their prey using two spear-like appendages, and a pair of powerful claws. They are very intelligent and beautiful creatures, which prefer lower lighting, sufficient rocks, and a sand bed. Be sure to ground your aquascaping before adding sand, as the Zebra mantis Shrimp will certainly burrow under the rocks and may cause an avalanche. It is best to use epoxy to secure your aquascaping, and ensure no accidents happen. The extremely powerful claws of the Mantis Shrimp have earned them the nickname “thumb splitters” by some modern divers. Please take great care not to become a victim! Mantis Shrimp attack with the speed of a .22 calibre bullet. The Mantis Shrimp strike is so fast, that cavitation bubbles are formed between the claw and the surface being struck. Essentially, the results are that the prey is impacted first by force of the claw and next by the cavitation bubbles collapsing. The collapsing cavitation bubbles generate such a force, that on their own, they are able to stun or even kill the prey. There are stories of very large Mantis Shrimp that have been able to break through aquarium glass with a single strike, although this is quite rare. Wow, that’s insane. I see a trip to the ER in that kid’s future. That mantis must be like a puppy to allow being handled that way.